Thank you to everyone who contributed clothes and shoes for Kammwamba School in Malawi. We have now delivered 45 boxes to Glasgow into the care of Professor Brian Kelly, who will send it in a shipping container, along with his team's refurbished computers and other charitable contributions to Malawi. The container should leave, hopefully, by May 2018, once it is full, and arrive at its destination around August 2018. We have also sent postcard messages from our Junior and Infant School, as well as the group who sorted and packed all the clothes and sealed and labelled all the boxes throughout the term. It's Chisamba Community Day Secondary School in Lilongwe, Malawi expressing great appreciation for the four (4) computer sets and a printer which your organization gave us in September this year. Members of staff are very happy working on the gadgets. The school is so grateful with the assistance lender to it. Thank you so much. On be half of Centre for Education and Orphans Resources (CEDOR) we would like to thank you for your kind organisation to care for the orphans and vulnerable children who are in need to have access of ITC services. We are thank full for your support which helps children in need have the place where they can have the help to help themself by sharing ideas each other and bring together all of them. We are thank full for your support which uplifted our organization from known as community based to community reading CBO and community supportive organization which now come to the number of four 4 computers. However CEDOR still need more computers to cover the number of sixteen computers that we planed to have in class which contain 18 students per class in 2 classes per day and also we are in need for photocopier which maybe can help to make our day to day be easy without cost. We are looking forward for your kindness and support. We hope this generosity will continue. Thank you for visiting our school and giving us the computers to be used by the teachers and the learners. Soon, we will start using them as we were putting enforcements on the windows and on the door for security reasons. I am happy that you enjoyed your work in Malawi and thank for the support you offer to the Malawian Community in various sectors. Thank you so much for the effort made. Send my sincerely appreciation and greetings to your team. You have done a good job. Thank you so much for the continued support. Thank you so much for your tangible thoughts and we really appreciate for computers you provided they are so useful to us. With profound thanks, i hereby write write to acknowledge receipt of four computers from your organisation to our organisation-Forum for Child Affairs Support (Forcas). Forcas is an organisation working with children providing education and youth empowerment programs. The computers will go a long way in addressing challenges of empowering the youth with computer skills. We offer skills training programs to the youth as a way of addressing employment challenges the youth face in Malawi. However, kindly i would like to ask for your favour to offer us more computers next year. Thank you for your support, Waiting for your more support next year. I refer to the above caption. At the college, we really thank you for timely donation of these two computers on 12th September 2017 that will assist us in our daily college operations and hope to have continued support from you especially as we are training the youth in skills development. Chongoni Community Technical College opened on 19th January, 2015 with the support from Government of Malawi to train youth in skills development after realizing the gap in skills to the youth who have been idle after secondary education. Most youth were being engaged in moral behavior as they were unable to be employed and had no skills to carry out their own businesses but with the coming in of these community colleges now they are experiencing changes and ably start their businesses. We have three classrooms against five courses which we are offering as a college namely: Bricklaying, Carpentry & Joinery, Fabrication & Welding, Plumbing and Tailoring & Fashion Design. As a college we need to have a well-established library for students and lectures get other needed information basing their courses. We don't have a nearby library to refer our students for help hence need some interventions for our college. In other courses, Instructors are not enough do to low incentives where in industries are being given, hence introduction of short courses for them to upgrade is the only solution to this. Hopefully you will come to our rescue especially computers and training to our lectures for the community to benefit largely. On behalf of Dedza Council, I would like to express my gratitude towards the assistance you always give to us every time. This year we received the team from Glasgow on 11th of September comprising of four members. They brought us computers, laptops and blackberry cellphones . The items have been distributed around Dedza District council here in Malawi. We always appreciate a good job you are doing to our council. I look forward to continued cordial working relationship with you. I wish to sincerely thank you and your colleagues for the donation of computers, laptops, monitors and computers accessories to Lilongwe, Blantyre and Zomba Campus of Malawi College of Health Sciences. These will assist alot in the training of our students. Thank you and everyone at Glasgow City Council who has made this donation to the College possible. It was very good to meet up at last after all the chat online and good to share a meal at the pottery, it's a lovely place and a bit of a haven. I have to say a big thank you to you and your group for the support you have given us, we would not have been able to get our stuff out to Malawi without your help. 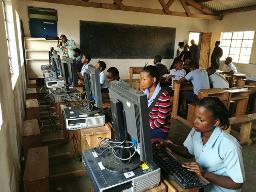 We delivered computers to Mulunguzi Community Day Secondary School. The school has an enrolment of 262 students against 15 teachers. We met with Mercy Jika and Patricia Chinsapo who received the computers on behalf of the headteacher who is currently sick. 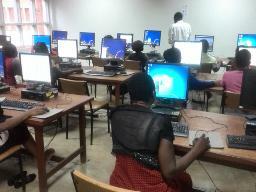 The school is very glad with computers because they will simplify their work by typing examinations, planning classwork and teaching learners how to use computers. They will be keeping all important records of the school such as schemes and records of work. On behalf of South West Education Division (SWED) I really appreciate the good gesture shown towards our schools and institutions. With thanks, I would like to acknowledge receipt of 6 sets of computers through Mr. Justin Kamwendo of SWED. On behalf of Naizi CDSS students I say thank you. This is a good development as the availability of these computers will help students to come to terms with the ICT trend at an early stage. However, we would like to ask that you consider more of the same for us in the near future since the number of students is bigger. We will be looking forward to having a fantastic working relationship with you. Molima is passing on greeting to all who visited Malawi and all of the Glasgow team. I would like to thank you all for the tremendous work you are doing in Malawi and for the wonderful gifts you give us they just come at the right time when we needed them you asked if we needed anything, yes blankets and pillows and for the computers the one you give us has no camera so one with a new system would be better. Once more to the all Glasgow team thank you so much for the wonderful good Lord work you are doing not only to Molima but everywhere in Malawi. Secondly the concern that you showed to the death of our Father the late Mr Isaac Banda therefore on behalf of the Banda Family do say thank you very much may the wonderful good Lord continue blessing you all bye for now. I hope this email will find you in very good health. I write to express our heartfelt thanks to you good people for the so many good gestures that you keep on showing us-IPCC. As I have been saying, we do not take this for granted. It takes a lot of your time, energy and creativity for the sake of the people of Malawi. Thanks for considering Interdenominational Pastoral Care Centre (IPCC) this year with the IT equipment. IPCC has received ten (10) CPUs, four memory sticks and five pens. Than you very much and may the Good Lord continue showering you and your team with numerous blessings as you endeavour to help the people of Malawi. Sad that some of the items have been stolen along the way. My apologies for that. In fact it has not only affected you but we the recipients too. As part of the growth of the IPCC, we have mobilized ourselves to establish an association or all professional counsellors in the country. The idea is to have one common voice when we lobby with the government for the recognition and accreditation of the profession. So this has brought in the birth of: Malawi Association of Counsellors (MAC). We have a Secretariat within Lilongwe city in area 47. We also have regional offices (3) in each region. Due to this development, this new National office has a few shortfall in terms of computers. Once more accept our thanks Sir on behalf of the team which is currently in Malawi. Thank you for your kind offer of computers for our teaching annexes at Queen Elizabeth Central Hospital. Today Fountain of Life offices received 2 Desktops. We wish to thank you for this donation. Its timely and will ease our office operations. If there are more opportunities in future for our 7 One stop Centers, we will be grateful if you could consider us. On behalf of members of staff of Lilongwe Prison and the entire department of prison I am in the position to convey my graduate for the donation of ten desk computers donated to the said station. Let's strengthen our mutual relationships between two partners and we are not taking it for granted but respecting your heart of given. Greetings from Lilongwe Malawi Poor Clares' Monastery. I am writing to thank you and Lord Provost's and International Office Glasgow City Council for 12 cartons of foot wear. We recognize your generosity we are going to give to our people who are most in need of shoes especially the orphans and the poor we are going to share with them. Let me take this opportunity to ask your office, if you can find the material for curtains and other cloth material you can also send us. We are building the infirmary but it is still in process. I will be happy to hear from you. Be assured of our prayers for the work you are doing to help the poor people and poor countries. Your consignment of Washing Machines and Plastic Mats arrived when we needed them most, for which we are EXTREMELY GRATEFUL. As you will see from my news and photos attached, we had quite a week .......with the arrival of Bed Bugs as well as washing machines... however, as I said, the arrival of the machines certainly lightened the load (excuse the pun). Many thanks again, we would have appreciated them anyway, but their timely arrival mean't they were even more appreciated! I write to greet you all and provide an update on what we are doing with the computers you gave us. These computers are handy especially to our students who are learning almost on everything in class about nursing as well as learning how to type assignments on computers, searching information on Internet using these computers in the lab, preparing presentations and many more. My writing is to again appreciate the good gesture you did by furnishing our laboratory with 20 computers and a laptop. As Robert said last time " I hope we can further develop the good partnership between Glasgow and Malawi for many years to come". I hereby acknowledge the receipt of the humanitarian goods comprises of 1-2bench top fridges of good use 2-6play mats of good use 3-4boxes of carpentry tools of good use. Thank you very much for the kind donation of the two laptops to our charity, The Scottish Association for Children with Heart Disorders. The laptops will be put to good use by the charity saving us from purchasing the same, allowing us to direct our funds to helping cardiac children. Our charity is made up of parents and friends of cardiac children and all give their time and effort free of charge. Once again thank you and all in your organisation for this kind donation. Please find below our Rossall News published today with the story of the arrival of our old school uniform to Kammwamba School. Many heartfelt thanks for all you've done so kindly for us all to make this a reality by processing and sending off the uniforms. As you can gather from the article in our newsletter, we are already campaigning for shoes to include with more uniform we've collected. Hopefully we can also get that sent off to Kammwamba School in due course. In the Summer Term of 2016, keen student volunteers filled and prepared forty big boxes with our old Rossall School uniform, which was so kindly donated by the Rossall parents. Mrs Lauren Platt initiated and coordinated the collection of the old uniform and Mrs Paula Porter then introduced us to Dr Mark and Jill Hendrickse, who have a strong link with a school in Malawi, where they also opened a day orphanage nearby. On 4th July 2016, we delivered the clothes to Mr Brian Kelly, a generous charity worker and friend of Dr Hendrickse in Glasgow, where it had to wait for a ship container to be filled up before it could be finally loaded and shipped for free to Malawi on 1st November 2016. It took almost four months, but the clothes all arrived safely at their destination in Ncheu, Malawi on 23rd February 2017! The Headteacher, Mr Dzino first opened box numbered 93 containing all the messages which our Rossall students had written on postcards for all the children at Kammwamba School and Miracle Orphanage. They celebrated the arrival of the clothes ceremoniously with jubilant children and teachers! We are very grateful our donated uniforms have been so well received and hope to do the same again this year. If you have any clean, old school shoes, trainers and football and rugby boots that are still in good condition to donate, then please drop them off in a bag at the RosShop. The Chapel Committee and Round Square Volunteers will then again pack and process it all to be sent to Kammwamba School, along with the rest of the old school uniform that has been donated since we delivered the first shipment to Glasgow. Just to update you that we managed to visit Maula Prison and Kawale Youth Centre yesterday. The prison Officials were happy to hear that you can give them PCS to be used by the Prisoners and the Officials as well. The security is fine and they qualify to have the PCs installed. They said they visited Dedza Prison and were impressed of your computer donation and how it is benefiting the inmates. As for Kawale Youth centre the rooms are also well secured and they qualify as well. Both parties are eager to have the computers installed. Belated happy New Year, 2017 to you and the entire Glasgow IT team from Youth and Adult Education and HIV/AIDS Training Centre (YAEHTC) members. We, as an organization, are very grateful to you and your entire team for the support in personal computers which you have been rendering to us during the time most organizations in Malawi are struggling due to lack of financial and material support because most donors pulled out Malawi following the infamous Cashgate Scandal. The year just gone by, was a very difficult year for the Free Computer Lessons and HIV/AIDS Training programmes due to persistent power black outs in Malawi which last for over 14 hours daily. Frankly speaking, most businesses and operations requiring electricity struggled to cope with these power black outs and small organizations like ours, which have no generators, came to a stand still. We hope that things will improve in the new year. Thanks for the response. I have taken too long to acknowledge the receipt of your mails because I had problems with my address. Hope you had Blessed Festive for both Xmas and New Year.